American Fabric Filter provides a complete range of custom manufactured liquid filter bags for all standard and most custom vessels in plain or glazed felts from ½ to 200 micron and mesh from 5 to 1,200 micron. Typical liquid filter vessels are top loading and have either a hinged or threaded lid. A metal restrainer basket fits inside the filter to support it under pressure. We offer many different options for the top including plastic rings, rings with integral handles, galvanized rings, stainless steel rings or drawstrings to fit any type vessel or application. AFF’s felt bags are made from the highest quality liquid filtration felts available. Felt is a low cost, high loading depth filter that is available in a wide range of materials. We carry polyester, polypropylene and nomex felts in the 1 to 200 micron range. 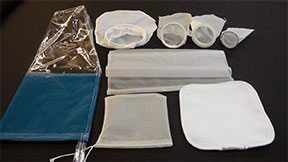 Bags are offered in singed or glazed finishes to help fiber migration and downstream contamination. AFF’s monofilament bags are made from precision woven monofilament fibers to ensure an accurate particle size retention. Monofilaments are very strong and can be re-used in most applications. Bags are offered in nylon and polyester materials in a range from 5 to 1,200 micron range. AFF’s multifilament bags are woven from strands of thread that have multiple filaments. This offers a more economical option over the monofilament bags. The particle size is not as precise as monofilament bags but they are very effective. They are available in polyester in the 75 – 1,200 micron range.